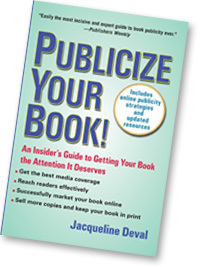 The 20 Rules for Writing an Effective Press Release – An Excerpt from PUBLICIZE YOUR BOOK! Whether you are writing the press release yourself or simply reviewing the release written by your publicist, you should know the rules of press release writing. The words FOR IMMEDIATE RELEASE appear on the top left of the page above the headline. Your contact name, phone number, and email address are stacked at the upper right-hand corner of the first page. Next comes the headline, in capital letters, usually in boldface, and centered on the top of the page to emulate an attention-getting newspaper headline. That headline summarizes why anyone would want to know more about you or your book, and announce some item of news interest. This headline is not newsworthy: NEW BOOK ABOUT BICYCLES TO BE PUBLISHED IN SEPTEMBER. This one is newsworthy: NEW BOOK REVEALS THAT TWO HOURS OF BICYCLING A WEEK CAN REDUCE RISK OF HEART DISEASE. A dateline appears at the start of the first paragraph and also includes the location of the news source, for example: (Charleston, S.C., July 26, 2008). Following the headline, the first paragraph of the release presents the most important information about your book. If you hide the most interesting and salient information deep in the body of the release – then you’ve likely lost the opportunity to capture the reporter’s interest. Present information in descending order of importance. The release should be no longer than two pages. Use double space or at least one-and-a-half spacing. Do not try to cheat for more space by single-spacing your text, which makes the release hard to read. Use letter-size stationery. Do not use sans-serif typefaces or others that are hard to read. Instead use easy-on-the-eye typefaces like Times New Roman or Garamond. Do not mix different typefaces in the same release. Customize your releases for the media you are pitching. It is better to send out 10 customized pitches to targeted reporters than 200 generic releases in a mass mailing. Mention any information of local interest in your lead paragraph. A debut book from an author from Cleveland is of greater interest in Cleveland than Minneapolis. Spell every word correctly and pay particular attention to the proper spelling of names. A reviewer of the first edition of this book thought this was an obvious thing to point out. Well, you’d be surprised at the number of sloppy press releases that cross reporters’ desks. Proofread the release several times, and verify that all information is accurate. Include any relevant quotes from your book, from you or an expert in your field, that substantiate and reinforce the topic of the release. Think of the release as an encapsulated newspaper article, and write it as such. Many reporters will include parts of press releases in the body of their articles. So familiarize yourself with the tone and style of newspaper articles to present your book in an informative and non-hyped way. Don’t use exclamation marks, which gives the release an amateurish air. Do not use hyperbole. Avoid hyped-up words and phrases like “destined for the bestseller lists”, “unique”, “best ever”, and “fantastic.” Write simply and concisely. Edit the press release ruthlessly to eliminate redundancies or unnecessary text. In their book, Jump Start Your Book Sales, Marilyn and Tom Ross offer this smart advice: Write all your promotional materials (including your press releases) from a benefit point of view. In other words, clearly convey what the reader or end consumer gets out of your book. After the first mention of your title in the body of the release, include in parentheses the name of the publishing house and the publication date. Book titles are conventionally written all in capital letters. Names are written as Joe Smith the first time he is mentioned, and after that, he is simply referred to as Smith, or, formally, Mr. Smith. At the bottom center of the release, after the body of the text, write -30- or ### to indicate closure. At the end of the release, list the publication date, page count, price, format (hardcover or paperback), publishing house, and ISBN. Also include the Web site address for the book.